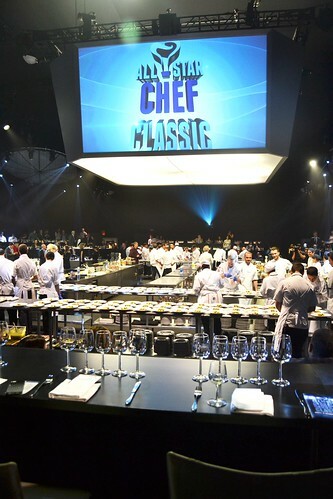 A few weekends ago, we had a fantastic culinary staycation in DTLA at the All Star Chef Classic. When the event was announced I was intrigued but since it was an inaugural event, the only information I could find about it sounded like a press release, but not real concrete details. Regardless, we hadn’t been to a food event in a while (except the LA Weekly Essentials) and it seemed like it would be a good time. Well, it turned out to be a FANTASTIC time! I can only imagine how much more fantastic it will be next year. The first event took place on Friday, March 21st inside of Kitchen Stadium. When the event was announced there was only a rendering of what the stadium would look like, so really we didn’t have much of an idea as to what to actually expect. So when we first walked into the stadium, I heard myself gasp at the view. It was much better than the rendering. As someone that enjoys, appreciates, and has a significant other that is a chef, we couldn’t believe the lineup for the night. We had read about who would be there when we decided to go (in fact it was one of the main reasons we wanted to go). The fact that these legends were going to be cooking dinner within the stadium – together – made it a once in a lifetime experience for us. 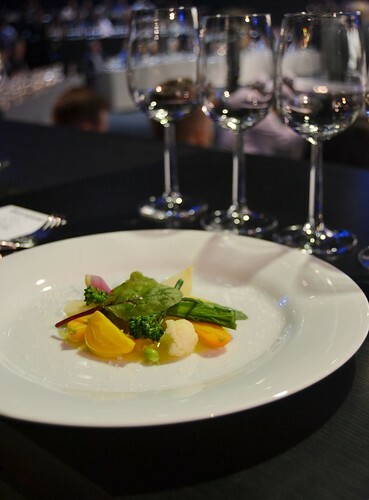 Course #1: Sweet and Sour Harlequin Vegetables by Alain Passard. 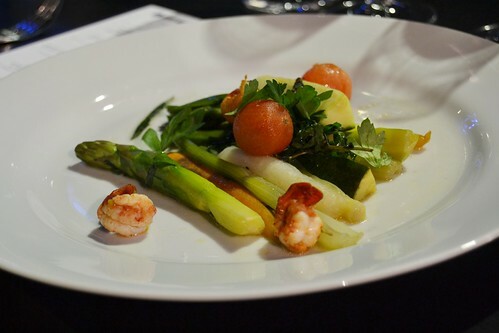 As this was being plated, Alain Passard showed the audience how he prepared his vinaigrette. He was also playful and looked like he was having a great time. Alain Passard is a culinary legend and his dish was excellent. Simple, yet so full of flavor. It was only in recent years that I had been hearing this name, so when I saw him listed as one of the chefs when the event was first announced I was excited to see him come to LA. I missed him at the MOCA Fooding event, but I had heard great things. His crab dish one of my favorites of the night because I love crab and I love love love citrus (check out my Maude post). 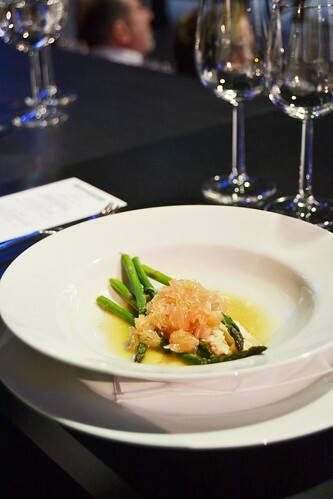 Marc Meneau is a Michelin starred LEGEND and he was joined by his son Pierre at the event. On the last day of the event I saw him just hanging out reading the newspaper, probably waiting for a cab to the airport, and couldn’t resist going up to him and saying thank you for a fantastic dinner. 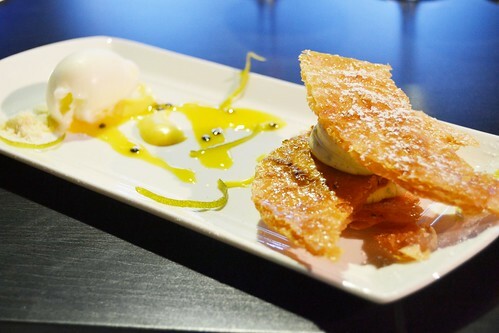 This dish reminded me of Trois Mec, which we had just eaten at a month prior. Coincidentally, it had been one of my favorite dishes at Trois Mec so eating a slight variation (this one had duck under the cabbage and no miso flan) was a real treat. I loved it so much. 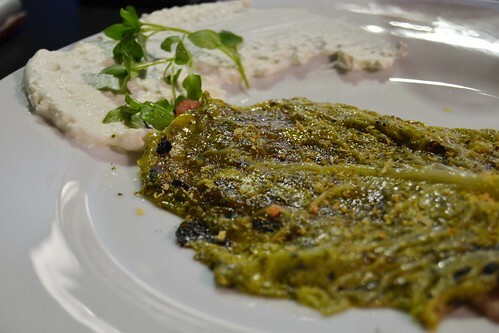 Who would have thought that grilled cabbage could taste this good! Of course people probably know Florian from Cupcake Wars, but he is a fantastic pastry chef in his own right. This napoleon was one of the best desserts I’ve had in recent memory. Plus, he was so gracious and fun to be around! 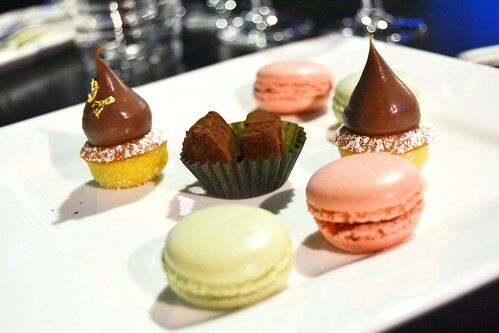 Petits Fours and LAMILL coffee. These were also made by Florian, and were accompanied by freshly brewed LAMILL coffee. Such a great ending to a memorable meal. 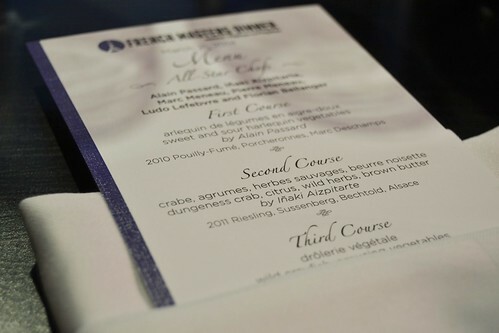 The French Masters Dinner was one of those memorable meals that is just hard to describe and reflect on. 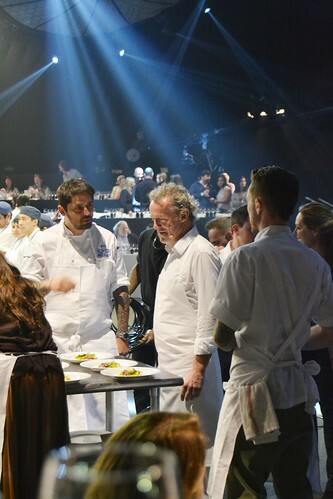 I know that I probably wont get to Alain Passard, Iñaki, or Marc Meneau’s restaurants in my lifetime, so for me, getting to see them here in my hometown, in my beloved City of Angels, hanging out, interacting with the audience, and preparing these special dishes goes far beyond just a food event. I’m glad we decided to attend, because this was truly a once in a lifetime experience for me. Hi! This post – and your blog – Makes me think about the movie Julie & Julia – you must have seen it. I just LOVE it! Aww! So sweet! Yes, I have seen it! Super cute movie! Yes, it´s a great movie and it combines themes that are not so common in movies: writing, writing about something that passionates you – and that happens to be food! And I am quite passionate about all these things! But cheers – and Bon Appétit – to you and your project!